Effective Thursday, July 20th, 2017 we have a more convenient parking option for our patients. We now have validated parking available for our patients in the City Center Square garage located under our office. 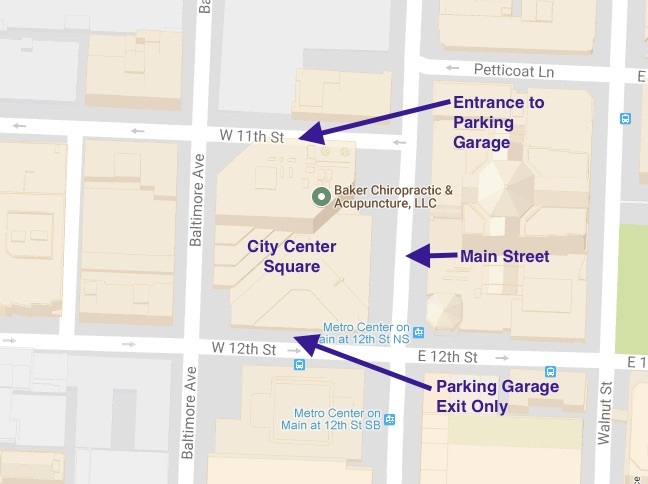 To reach the City Center Square underground parking garage drive to 11th and Main, turn west on 11th, and the parking garage entrance will be on your left between Main and Baltimore. Take the elevator to the 2nd floor, and then you will need to walk past the escalators to the bank of elevators nearest the security desk, and take the elevator to the 19th floor. Please remember to bring your parking ticket with you into the building, and have it validated at the security desk on the 2nd floor after your appointment has been completed. Please let the security desk know that you were here for an appointment at Baker Chiropractic & Acupuncture. If for any reason the parking garage says that it is full, please press the button to talk to the attendant. Please tell them you have an appointment with Baker Chiropractic and Acupuncture and they will let you in. They will advise you to come to the parking booth and the attendant will find a parking space for your car, and may even valet it for you if needed. The parking attendant will find a parking space for you. Please let us know if you have any questions, and we look forward to seeing you soon. If you would prefer to park on the street at your own expense, there is coin parking available nearby along Baltimore. Scroll Down to the 2nd map to see a map with parking garage location details. Below the 2nd map are easy instructions to Baker Chiropractic & Acupuncture from different locations in the Kansas City Metro Area. If you need parking directions from your location, please call us at 816-842-3603.